FOXBOROUGH, Mass. — There’s a story that has been passed down since the fall of 1962 in the football building on the grounds of the U.S. Naval Academy. That’s more than 400 miles south of the headquarters of the New England Patriots, but it’s relevant to what is going on here for an obvious reason. The Cold War was percolating then, and in October of that year the tensions escalated into the Cuban Missile Crisis. U.S. President John F. Kennedy addressed the nation on TV, explaining his decision to order a naval blockade around Cuba with the goal of preventing the entry of additional Soviet missiles. Amid the anxiety, though, there was a Navy football coach and scout, himself a World War II veteran, who doggedly refused to lose focus on his job. Or so the story goes. On Oct. 27, the day before the 13-day missile standoff lifted, Navy beat rival Pitt, 32-9. There’s no comparing national crises to those in the NFL, but this old tale is a pretty good clue as to the origins of Steve’s only son’s infamously brusque tactics for walling off himself and his team from anything that could take away from football preparation. Perhaps more than ever before—which is saying a lot—Bill Belichick’s team is operating as an enclave; a self-contained bubble functioning independently of the fact that Tom Brady vs. the NFL still looms unresolved. Key dates are upcoming: Aug. 12, a settlement conference in New York that Brady and commissioner Roger Goodell are expected to attend; Sept. 4; the deadline by which both the NFL and the players union have asked U.S. District Judge Richard Berman to decide whether or not to confirm Brady’s four-game suspension; Sept. 10, the Thursday night regular-season opener that is usually the NFL’s fete of its reigning Super Bowl champion. The Patriots, though, are functioning as if on a regular old training camp schedule, while their players and coaches are going to great lengths not to so much as acknowledge Deflategate. Brady, rebuffing NFL media policies, has not yet talked to reporters through a week of training camp. All together, it creates the same kind of eerie calm that often exists before a big storm touches down: You know something is brewing, but it hasn’t quite manifested itself yet. The fans ringing the wall around the field of Gillette Stadium during a Wednesday night practice, shrieking as they stuffed Brady jerseys (from New England and the University of Michigan) and helmets and photos in his face for autographs, embodied the outcry of support from within the Patriots enclave. The six New England states, it seems, are efforting to be louder than the rest of the NFL nation combined. 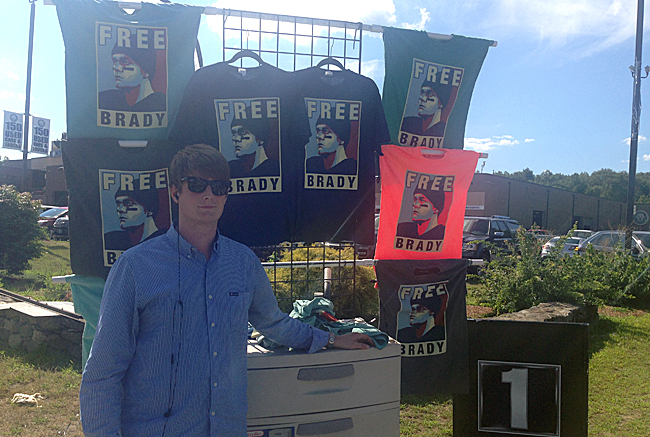 For sale are “Free Brady” T-shirts, priced between $20 and 25. The company has sold between 3,000 and 5,000 each week since early May—right after Ted Wells concluded in his report that Brady was “at least generally aware” of the intentional, illegal deflation of footballs used in the AFC Championship. They can’t restock the size-large shirts quickly enough. He’s even been selling the Free Brady banner to fans passionate enough to shell out $150 (he untacks it from the telephone pole and replaces it with another next day). As he said this, a Massachusetts state trooper pulled up and rolled down his window. Not to worry—he was just asking for directions to parking lot P7. He figured the guy at the Free Brady stand, essentially a local business at this point, would know. • NO ONE NAVIGATES A MINEFIELD BETTER THAN BELICHICK: Through roster turnover, catastrophic injuries and scandal, there has been one constant in the Belichick era: wins. How he has done it in the past, and how he’ll get it done this year. Free Brady shirts and signs runneth over at the Wednesday night practice attended by 23,497 season-ticket holders and fans, plus lots of other homemade posters: “The Greatest Are Always Criticized #FREEBRADY” on orange posterboard. Another: “Goodell’s A Fraud,” over a picture of commissioner Roger Goodell with a Pinocchio nose. Brady was handed a sharpie after the night practice and moved quickly and efficiently through a quarter turn of the stadium, signing approximately one out of every 25 hats and shirts and photos extended down from the stands. Then, before he hit the 40-yard line, behind which the media was instructed to stand, he disappeared down the staircase leading to the locker room. The NFL’s preseason media policy is similar to that of the regular season, with all players required to be available regularly, and one or two players with heavy media demands required to speak only once per week. It has been a week of practices, and the only public comments from Brady remain a Facebook post after his suspension was upheld by Goodell last Wednesday, the morning training camp opened. Patriots players and coaches are allowing team owner Robert Kraft’s bold statement last week—in which he apologized to fans for accepting team penalties from the NFL in the hopes it would exonerate Brady, and said he was wrong to put faith in the league—to stand for the whole organization. The only further peep since then came via a sly dig by Jonathan Kraft, the owner’s son and team president, at the ceremony for McGinest and Houston Antwine Wednesday night. While thanking Raytheon, the aerospace and defense contractor that sponsors the team’s Hall of Fame, he took a jab at the imprecise applications of the Ideal Gas Law that weaken the Wells Report. Not everyone in the audience caught it, but those who did cheered. Even when it comes to on-the-field matters, the Patriots are proceeding so far with Deflategate blinders on. First-team 11-on-11 reps with the starting offensive line and top receivers have belonged to Brady. Will that change? And if so, when? Yeah, you guessed it—they’re not saying. Back-up Jimmy Garoppolo, the presumed opening-day starter unless Brady’s suspension is wiped out completely, got his most extended work of camp Wednesday night, though it was mainly with a mix of second-string linemen and receivers. Just like last summer, the unpadded stadium practice ended up being a very light day for Brady and many of the team’s established starters. Brady, along with tight end Rob Gronkowski, center Bryan Stork and tackle Nate Solder, would take the first rep or two during each 11-on-11 period, then rotate out. On one occasion, in the second team period, Garoppolo came in after Brady took one rep, but apparently that was too soon. Brady booted him from the huddle to run one more play. Garoppolo had a shaky night with his extended reps, completing less than 50% of his pass attempts, at times sailing his throws too high or holding on to the ball too long. His best play came late in the third team period, a beautifully thrown pass that hit receiver Josh Boyce in stride deep. It was a reminder that he could use more days like this if he ends up having to start the first four games of the season, but he says he enters each practice with no idea how many reps he’ll get. 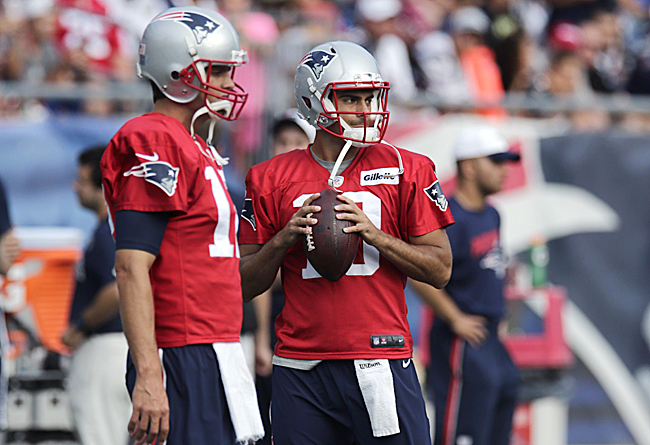 • CAN JIMMY GAROPPOLO HANDLE THE HEAT? : The 2014 second-round pick out of Eastern Illinois could lead the Super Bowl champions into the 2015 season. Who the heck is this guy? The biggest decision still to be made—how many games Brady will play this season—is out of the Patriots’ hands right now. Berman has been asked to rule not whether he thinks Brady is guilty of any wrongdoing regarding the inflation levels of football, but rather, if the NFL used a lawful process to punish him. Berman is pushing for a settlement, but bridging the gap between Brady missing zero games and missing four games will be a delicate balancing act of principles, precedent and reputations. But in the Patriots enclave right now, The first rule of Deflategate is: You do not talk about Deflategate. So, for example, when McGinest was called over to privately address the team after one practice, he talked about staying tight-knit and staying a team and sticking together through adversity, without specifically mentioning what adversity. When meeting with reporters, receiver Danny Amendola was asked what the biggest challenge of training camp has been so far. He mentioned the weather. It was a little hot one day, he revealed. And humid.